Many of us at work have been geeking out over Pokémon Go and I got permission to make a tutorial and a bunch of showcase projects combining my love of the game with some EL panels. Go read all about it over on the SparkFun blog. Special thanks to my friend Geoff Decker of Hidden Vision Photography who took all the awesome photos for the blog. Lately there are an increasing number of shoes on the market that incorporate technology, from running shoes that sync with your iPod to high fashion illuminated heels. Here are a few cool tutorials that show you how to build your own tech-infused footwear. This Instructable shows you how to repurpose the electronics from a pair of kid’s light up shoes and put them into your favorite pair of sneakers. Another pair of LED shoes, this tutorial has you build the circuit from scratch using conductive thread, LED sequin beads and puff paint (for insulation and decoration). Metal snaps in the tongue creates an on/off switch. Alison Lewis of I Heart Switch shows you how to achieve a look inspired by Rodarte’s high fashion light up heels. Diana Eng’s book Fashion Geek has a project that uses electroluminescent wire instead of LEDs to add some glow to your footwear. Honestly, who doesn’t want to make a shoe phone? Instructables member gardners has a series of Get Smart projects that look like a lot of fun. This one uses a mobile phone and bluetooth headset. Using force sensitive resistors and an Arduino, these cool sneakers translate your toe-tapping into triggers for sounds. I love these ‘Back to the Future’ inspired sneakers that have been getting a lot of press lately. Great use of a servo and zip ties! 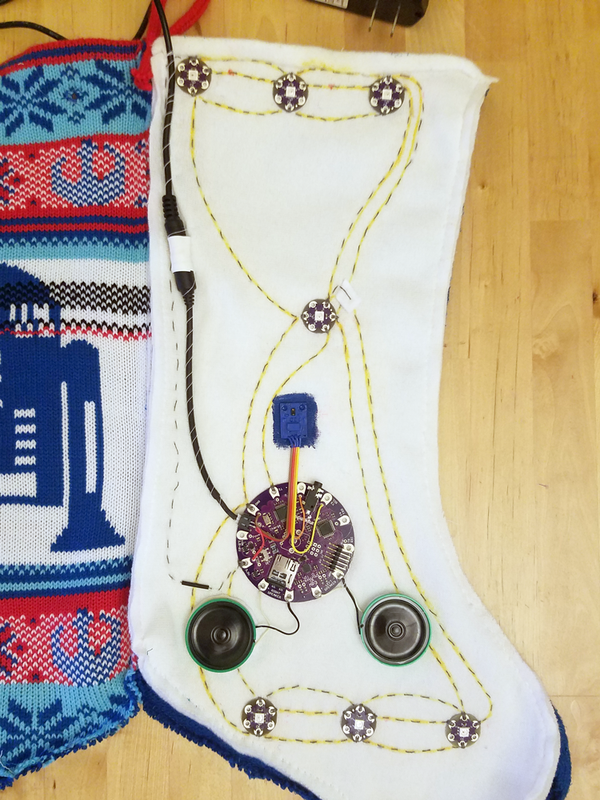 Hannah Perner-Wilson’s tutorial uses conductive fabrics to make analog pressure sensors in custom slippers. These can then act as controllers for a drawing program in the Processing environment. This project hacks parts of a crank flashlight and places them in the heel of the shoe for a boost of power when you walk.